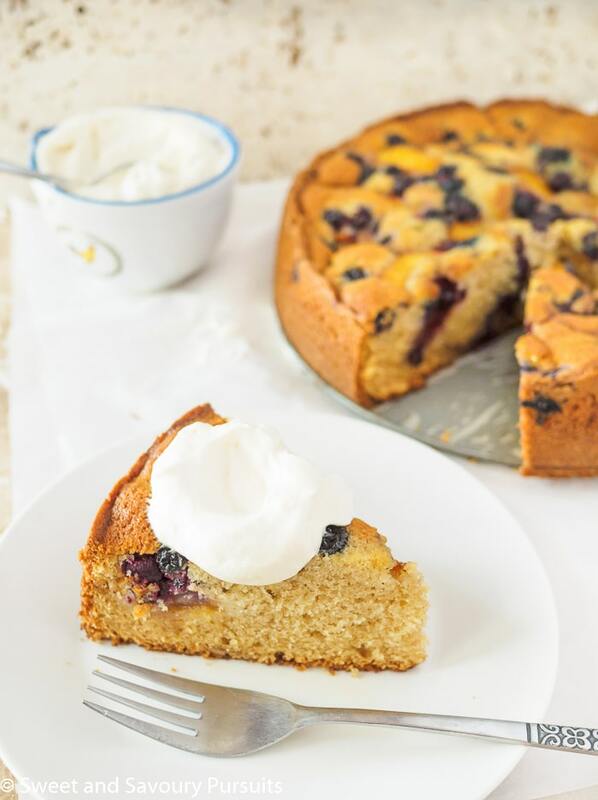 This simple and delicious Fresh Peach and Blueberry Cake makes a delightful summer dessert and is perfect for casual entertaining. It’s already the end of August, and in only a few weeks it will be the end of summer. But before I say goodbye to summer recipes and start baking fall desserts, I had to share this seriously delicious fresh peach and blueberry cake. The recipe is an adaptation of Ina Garten’s peach cake. Her version has pecans in it, but since I needed to keep this cake nut free I used blueberries instead. I can’t recall the last time I tried one Ina Garten’s recipes, but if all of her recipes are half as good as this cake, I need to remember to try more of them. 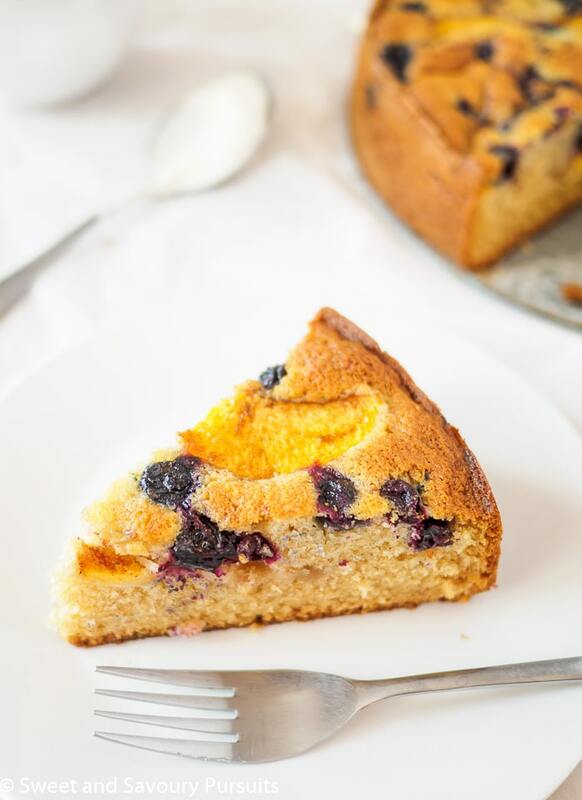 This cake was easy to make and so moist and tender with fresh ripe peaches and blueberries on top of a flavourful cake base. Just a little bit of cinnamon and cardamom added to both the cake and fruit adds a touch of warmth and spice to this dessert. This cake makes an excellent brunch cake and is perfect for casual entertaining. Baking this cake in a springform pan ensures it’s easy release from the pan without the need to flip it over. I used a 9-1/2 inch pan, but anything between 9 and 10 inches should work perfectly. 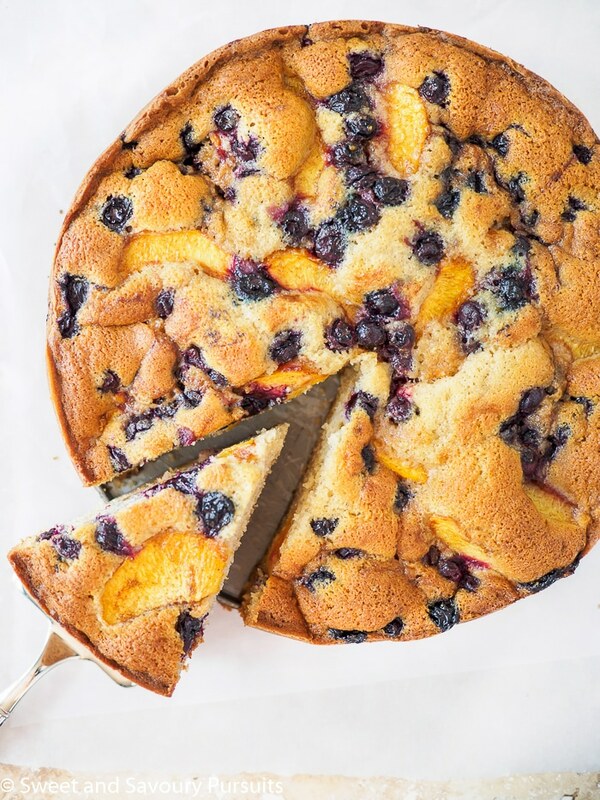 Go ahead and treat yourself to a slice of this fresh peach and blueberry cake, you’ll be happy you did! This delicious Fresh Peach and Blueberry Cake makes a delightful summer dessert and is perfect for casual entertaining. Place rack in the middle of the oven and heat oven to 350ºF. Line the bottom of a 9-1/2 springform pan. Set aside. In a medium bowl, sift the flour, baking powder, baking soda, salt, cinnamon and cardamom (if using). Set aside. In the bowl of your mixer, add the butter and granulated sugar and beat on medium-high for 3 to 5 minutes or until mixture is fluffy. Scrape the sides and bottom of the bowl before gradually adding the flour mixture on low-speed. Once the flour has been incorporated, increase the speed of the mixture and beat until batter is smooth, don't over-beat the batter. In a small bowl mix the peaches and blueberries with the brown sugar, cinnamon and cardamom. Spread the batter evenly into the cake pan. Add the fruit to top of cake by arranging peaches in a circular pattern and scattering the blueberries in the gaps. Bake for approximately 45 to 55 minutes or until a toothpick inserted in the middle of the cake comes out clean or with a few crumbs clinging to it. Cool cake on wire rack for 10 minutes before running a knife along the side and releasing the cake. Serve the cake at room temperature with lightly sweetened whipped cream or vanilla ice cream. This cake looks absolutely delicious! Just came across your blog and I love this recipe! This happens to be one of my favorite fruit combinations for desserts, Fida. I’ve made cakes, pies and cobblers in the last few weeks with this awesome two-some. Thanks for sharing another must try recipe for my blueberry/peach arsenal. This cake looks wonderful and the flavors sound delicious! That’s great Nancy, I can see why it would be one of your favourites, they are so delicious together! I just love this kind of cake, rustic and homey and just as good for breakfast as for afternoon tea. What a great way to enjoy fresh peaches and blueberries. (I’ve made the Raspberry Buttermilk Cake a few times and love it.) Thanks, Fida! Hi Louise, I agree I love the no fuss aspect of this type of cake! Glad to hear you’ve been making the raspberry cake, that’s another delicious dessert. Fida that cake looks so delicious, Oh my!! !